Converse‘s iconic Chuck Taylor All-Star Hi is a tried-and-true summer staple, a shoe with unyielding popularity among children and adults alike. For Spring/Summer 2019, the heritage sneaker label subverts the substantial ’70s iteration with a trio of headturning seasonal colorways. Like JW Anderson’s recent “Toy” pack, these three Chuck Taylors boast gummy-looking translucent rubber midsoles, adding a splash of color to the lower portion of the classic shoe. Furthermore, each of these three models features a different pattern on the lightweight cotton uppers, with complementary Converse badges on the lateral side of each design. A trio of American flag-inspired colors grace the first silhouette, with red, white and “Converse Blue” color-blocked across the upper, finished off with white rope laces and a pale blue midsole. Next up is a Chuck Taylor covered entirely in warm-hued plaid. Shades of red, green, brown and blue inform the pattern, offset by white contrast stitching and a pink midsole. Finally, a monochrome sneaker sports a black midsole and laces against its deconstructed-looking upper. A patchy white-on-black pattern adds visual texture, which is completed by a stitched-on black strap and tonal silver Converse badge. 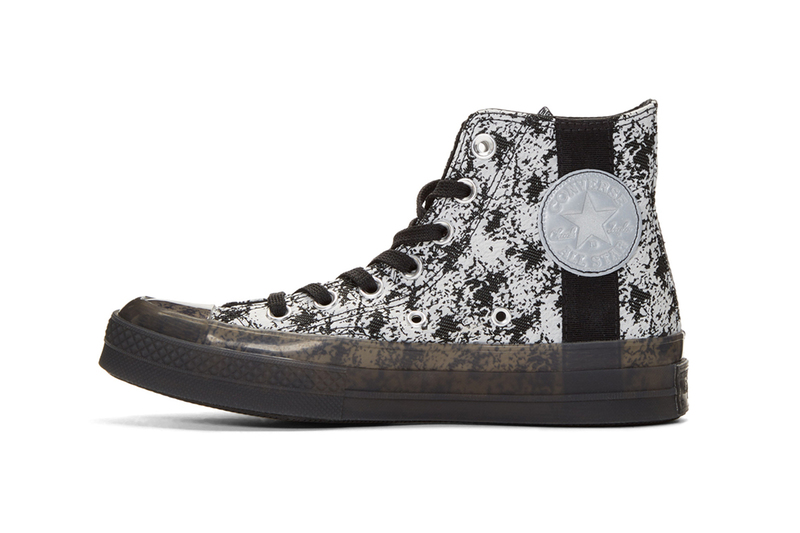 Shop the adventurous seasonal Chuck Taylors on SSENSE’s site. Recently, Converse’s signature footwear model was upgraded with lush suede and RIRI zippers. Directed by the Ummah Chroma collective.